Traumatic Boutonniere deformity little finger. 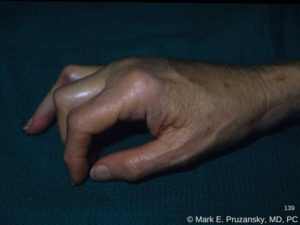 The Boutonniere deformity occurs when the finger joints become bent and fixated at an angle. The middle joint of the finger is bent inward, toward the palm, while the third joint is bent at an upward angle. 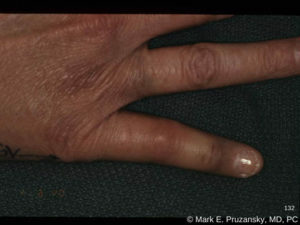 Over time, this deformity could worsen and cause an increase in stiffness of the affected finger joints. Many patients with Boutonniere deformity will notice a worsening range of motion and will become less able to complete normal daily activities. A boutonniere deformity can happen after an accident or as a result or arthritis, making it important for people of all ages to be seen by a skilled hand surgeon such as Dr. Mark Pruzansky or Dr. Jason Pruzansky. With proper diagnosis and treatment, patients experiencing Boutonniere Deformity may be able to regain use of their hands and minimize any possible discomfort discomfort. Boutonniere deformity causes a clear visual difference in the way the finger is able to extend. When the tendons that are responsible for flexing your finger are damaged, your finger may become “stuck” in an awkward, bent position. If you notice that the middle joint of your finger is bent toward your palm, while your third joint is bent upward, you may be experiencing Boutonniere Deformity. Additionally, there is usually associated stiffness and decreased motion of the finger. Though this condition may be caused by an injury, experiencing pain with Boutonniere deformities is less common. The underlying cause of the deformity is damage to the main extensor tendon attached to the top of the finger’s middle bone. After this tendon injury, the middle joint can no longer be extended. Over time, other small tendons that run along the top of the finger – the lateral bands – subluxate downwards, which further contributes to bending of the middle knuckle. 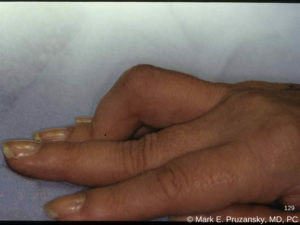 These intact lateral bands also lead to unopposed extension of the tip of the finger. Boutonniere Deformity can result from a jam, blow, cut, or the effects of Rheumatoid Arthritis. Boutonniere deformity is a condition that is sometimes seen in athletes, such as basketball and volleyball players who may injure their fingers while playing. If you believe that you have a Boutonniere deformity, or if you’ve recently injured your finger, you should schedule an appointment with a highly skilled hand surgeon to get a proper diagnosis. A careful physical exam using certain special maneuvers will identify the deformity. Understanding how the injury has occurred, whether due to a recent traumatic event or a long-standing inflammatory disorder, is also essential to creating a treatment plan. As a part of the exam, patients will get an x-ray to better help the doctor evaluate the condition of the joints in the finger, since joint fracture, subluxation, inflammation and degeneration can be the underlying culprit causing the deformity. Boutonniere deformities can often be successfully treated with non-surgical methods. Acute and simple cases of this condition, while the patient still has somewhat flexible joints, can be treated with splinting for 4-6 weeks and stretching exercises. In cases where fractures, lacerations, or advanced rheumatoid arthritis cause the deformity to occur, surgery may be required to repair the injured tendon or reconstruct the joint. Please contact us as soon as possible to schedule an appointment with our talented team. Boutonniere deformity is best treated as early as possible to help the patient regain as much functionality as possible. Call Dr. Pruzansky at 212-249-8700 to schedule an appointment and start to obtain an accurate diagnosis.